– Athletics Kenya head Isaiah Kiplagat banning Kenya’s top athletes from the Rome DL on Thursday for a drop in form. 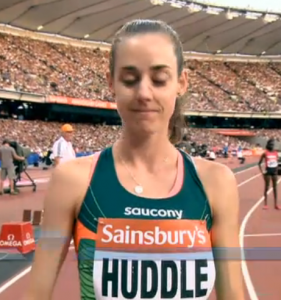 Funny, as Eunice Sum, one of the banned athletes, just set a 1,500 PR at Pre. Why anyone would schedule the Commonwealth Games Trials this weekend and not during the 19 days from June 14 to July 3rd when there are no DL meets is beyond us. Which elite runners drink coffee? 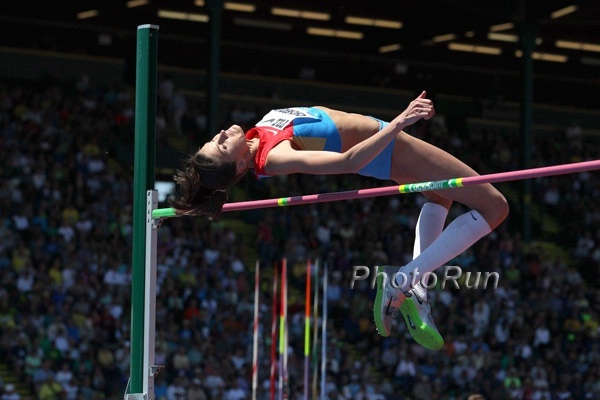 Diamond League...Where are the Russian Women Middle distance runners? 5 high level Taliban commanders for 1 low level deserter? It’s spring cleaning time at LetsRun.com and we present to you the results of our male stars doping polls – from Chris Derrick (7%) to Taoufik Makhloufi (87.6%) and everyone else in between, who do the most sophisticated track and field fans think are “clean” and who do they think are “dirty”? A Day In The Life Of World Champ Chanelle Price: Chanelle Price Runs Twice A Day, Lifts Weights, Works A Job, And Volunteers Each Day She says survives on $25 Subway cards her parents send her in the mail – someone get her an endorsement deal with Subway. 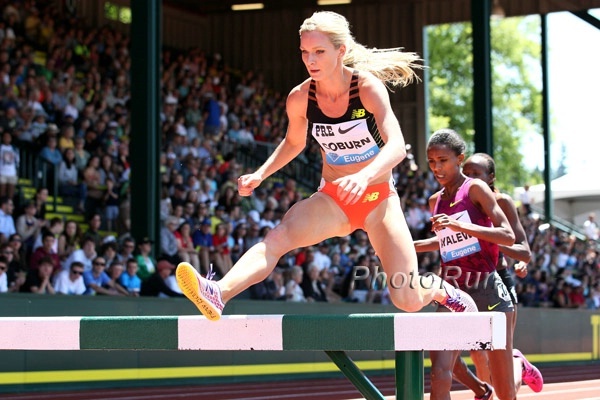 IAAF Q & A: Jenny Simpson’s Favorite Workout, TV Show Is … A long run and the West Wing. And The Powerhouse Track Conference Yet Again Is … The SEC: SEC Leads NCAA Qualifying By Average 15 Qualifiers Per School PAC-12 was 2nd at 11, Big 12 third at 10. Our beloved Ivy league was 6th at 4. RIP: Former Mt. SAC Relays Director Dan Shrum Shrum led them from 1988 to 1996. 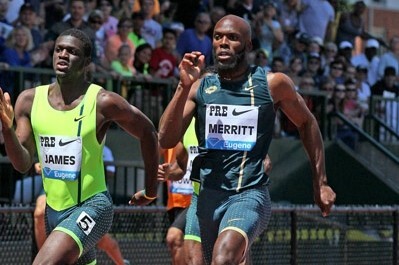 The Daily Relay’s Monday Morning Run: A Look Back At The 2014 Pre Classic Their performance of the meet was Rupp’s 10k but they also loved Nijel Amos‘ swag and the Kenyan women. Trinidad & Tobago’s 2008 Olympic Medalist Richard Thompson Ran 9.74 Over The Weekend – With No Wind Reading Unlike Flo-Jo back in the day, he admits it was very windy. Ellie Greenwood Was The First British-Born Woman To Win The Comrades Maratho -, Despite Winning, She Says She Had A “Terrible Race” We hope the Brits realize she’s Canadian. Regardless, Greenwood came from 8 minutes back to beat the Russian twins who had won the previous 10 races. 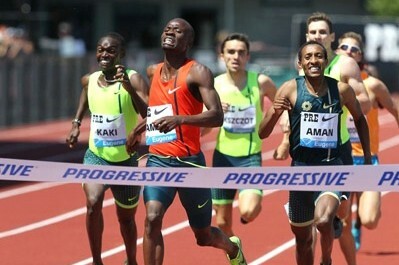 LRC Taoufik Makhloufi Talks About His Famous Premature Celebration We caught up with the Olympic champ after his race in Eugene to talk about his race that went viral. 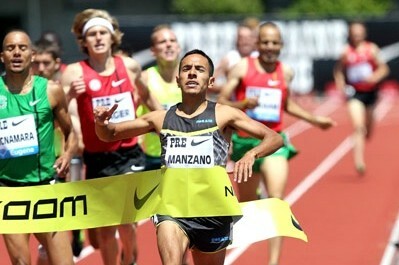 LRC 6 Quick Takeaways From The 2014 Pre Classic Oh, baby! What an incredible 2.5 hours. 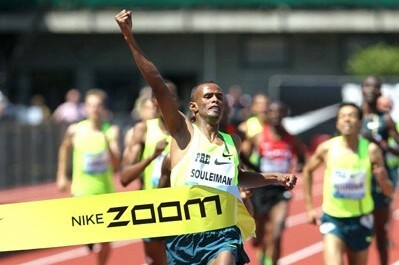 The Bowerman Mile was historic, Jenny Simpson PRed for the first time in 5 years, David Rudisha and Mo Aman both lost. So much to talk about. We get started here. Story On Alexa Efraimson’s Decision To Skip Pre, Run States And Get Rewarded With The Fastest-Ever HS 1,600 Of 4:33.29 Efraimson definitely can go way faster as her splits were 67-71-70-65. 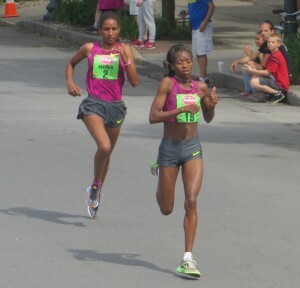 20-Year-Old Solomon Deksisa Runs 60:10 at Suja Rock ‘N’ Roll San Diego Half Marathon; 20-Year-Old Ethiopian Birhane Dibaba Upsets Boston Champ Rita Jeptoo In 69:34 60:10 is the fastest on US soil in 2014. Jeptoo ran 69:37. Ben Bruce “Wins” Suja Rock ‘N’ Roll San Diego Marathon In 2:23:50 Alan Webb paced Bruce through 14 miles. More Road News: Minneapolis Marathon Cancelled Due To Lightning As a gesture of good will, Grandma’s has re-opened race registration until June 2. Gert Thys Took The Lead Just After Halfway He was behind at halfway but soon seemed to be on his way to victory. LRC A Fan’s Guide To Rome Golden Gala: Top Stars To Clash In 800s (Amos Vs. Aman; Sum Vs. Martinez) And 1,500 (Souleiman Vs. Kiprop); How Low Can Molly Huddle Go In 5,000? 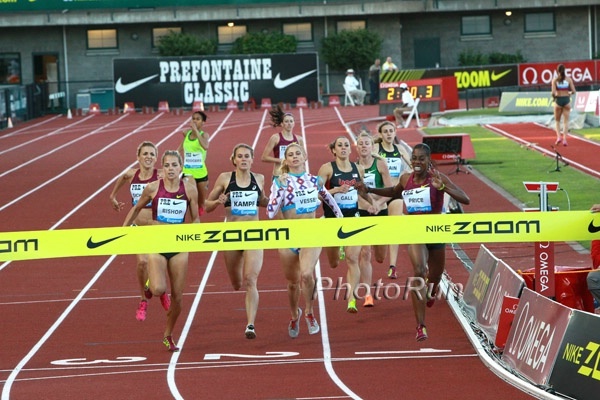 (link fixed) The turnaround from Eugene is short and there will be men’s 800 and 1,500 rematches but also a women’s 5,000 with Genzebe Dibaba and an in-form Molly Huddle, a women’s 800 with Sum and Martinez, plus a men’s steeple. Unbelievable: Athletics Kenya Bans Kenyan Stars From Rome DL For Drop In Form – Will They Obey? Truly unbelievable. The head of Athletics Kenya apparently doesn’t care about signed contracts or the fact that many of the Kenyan stars like Silas Kiplagat and Eunice Sum just set PRs in Eugene. He wants them back for the Trials being held for the African champs and Commonwealth Games. 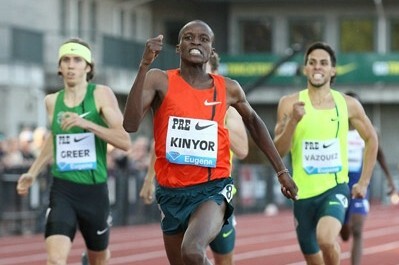 *Kiprop To Run In Rome Despite AK Threat “I’m in Rome now and preparing to run on Thursday and I will be back for the final day (Saturday) and will compete if I’m invited,” said Kiprop about the AK ban. IAAF Preview Of Rome: Unreal HJ With Bondarenko, Ukhov, Barshim And Drouin In addition, the meet also features a great women’s 100H with Bianna Rollins and Sally Pearson clashing with each other and world indoor champ Nia Ali,and a slew of other great events. Good Read: Meet World Indoor 60H Champ Nia Ali – For Now, The “Greatest Pure Athlete” That USC Coach Has Ever Seen Will Stick To Hurdles, Hepthalon Return Will Come After 2016 Games Coached by fellow hurdler Ryan Wilson, Ali is fully back into track after her father’s murder-suicide in 2009. 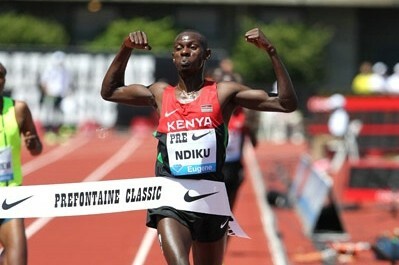 Will Ndiku, shown here at Pre last year, have reason to celebrate on Friday? *Allyson Felix To Run ExxonMobil Bislett Games For 1st Time Next Wed.
Lausanne Is July 3rd: Simon Hart: Tyson Gay To Return To Action And Face Justin Gatlin In Lausanne As “Fans Fume” We like the creativity of the meet organizers. We imagine the asking price for Gay is way less than Bolt/Blake. Lausanne is the meet that three years ago actually lost a “restraint of trade” court case for trying to prevent doper Hind Dehiba from competing. 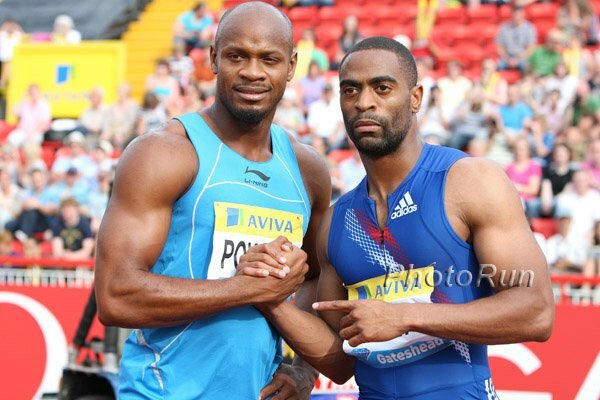 *MB: Gay vs. Gatlin, Lausanne, July 3. Just say No. Trey Hardee (8518) And Katarina Johnson-Thompson (6682) Win At Gotzis Multi Meet Brianne Theisen-Eaton set a new Canadian record but finished second. *British Press Goes Ga Ga: Katarina Johnson-Thompson Is Now A Threat To Jessica Ennis Hill? Good Read: Meet The NY/NJ Track Club’s Ex-Football Player But Soon-To-Be Sub-4 Miler, Ford Palmer Palmer started his collegiate career at Monmouth as a 185-lb. football player. 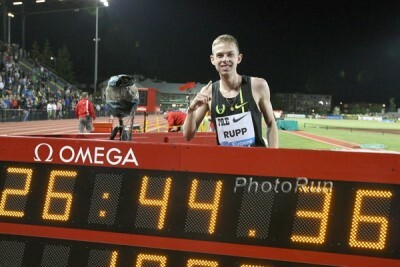 30 pounds lighter, he’s now a 3:38 1,500 runner who three times in three months has run between 4:00 and 4:01. Bring Back The Mile: California’s Gabriel Hilbert (3:55) And Marina Vorderbruegge (4:36) Win 2014 Platinum Performance State Street Mile In Santa Barbara In the unofficial tail-wagging Dog Mile world championship, Geoffrey Gray and dog Hank Mardukes and Brian Duff and dog Kadym finished in a dead heat to share the win (4:32) as Kasey Urman and her dog returned to claim another women’s title in 5:29. Fixtures From 1964 Tokyo Olympic Stadium Up For Sale Get a royal box seat for just ¥250,000 ($2442). LRC is interested in the manhole covers for just ¥20,200 ($197). Press Says Seb Coe To Head BBC Trust But He Has TWENTY Jobs Already – Is It Too Much? He reportedly makes a cool $2.5 million a year. 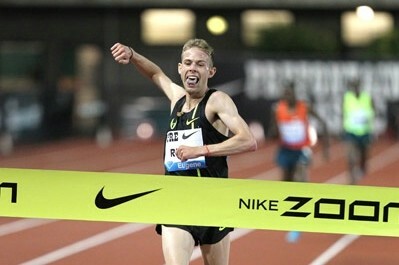 *LRC US HSer Blake Haney Runs 4:10 Haney feels he’s fitter than last year when he ran 3:55 for 1,500 but this race was set up to run 3:55.